The FA series utilizes a high pressure solenoid and microcomputer operated controller to seal almost any bag easily and securely. FA series is an excellent sealer for the semi-automatic packaging of thermal form flexible films. 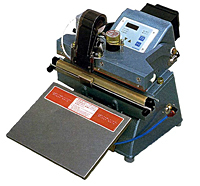 The sealer is also light, compact, easy to carry and can even be placed on a small table. It is very simple to use, and no speciall skills are required to make a beautiful and strong seal. Use the touch panel on the control unit to set conditions such as the heating temperature. To set the settings, use the Mode Switch. After setting the appropriate sealing condition for the packaging material, select either automatic continuous operation or manual air-pedal operation. The sealing pressure can be easily adjusted according to pouch thickness and material. Adjust the pressure by turning the pressure-adjusting nut located at the center of upper seal jaw (pressure lever). FA series is good for seal lengths of 200mm/ 7.8″, 300mm/ 11.7″, 400mm/ 15.6″ and 600mm/ 23.4″. Models for seal width of 2mm/ 0.07″, 5mm/ 0.19″, and 10mm/ 0.39″ are available. In addition to a single heater type capable of sealing materials up to 0.3 thick , there is a double heater type capable of sealing thick or laminated bags up to 0.4mm thick in total thickness of overlapping sheets.The double heater type is good also for gusset pouches. Users of the FA-200 and FA-300 series of sealers may use the attached table-switch plate instead of the operation-start switch. The applied pressure may be adjusted according to the weight of the package content. When using the table-switch plate, set the air pedal under the table-switch plate. The FA-200 and FA-300 series of sealers are shipped with the air pedal set under the table-switch plate. The table-switch plate is standard-equipped on the FA-200 and FA-300 series of sealers, and can be installed only on these sealers. Also oprional hot-stamp printer, FEP-N1 series is avairable on request. *Please note that the machine color is white for the North American model.